Taco iSeries Mixing Valves are a breakthrough in precision, cost effective temperature control for heating systems. 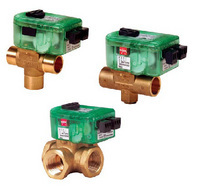 The iSeries valves are available in two versions, providing either outdoor reset control or fixed water supply temperature by modulating the position of a 2-way, 3-way or a 4-way valve. Additionally, iSeries valves protect the boiler against flue gas condensation. A microprocessor-based control is built into the valve actuator, to which all wiring connections are made. All-in-one iSeries Mixing Valves deliver optimum zone-by-zone temperature control, with built-in boiler protection (you will need to order the optional boiler protection sensor for this feature).